A musical journey on the arc of Love and Romance with American Songbook and Broadway favorites from Sammy Cahn to Harry Connick. it's an eclectic mix of fun, fantasy & personal stories. Emmy Award winning actress, singer, producer, director and Broadway star, Lucie Arnaz releases her first LIVE CD! Accompanied on piano by Ron Abel, (one of the finest musicians on the planet) Lucie swings you through a musical journey about the facinating arc of Love and Romance dishing up an ecclectic mix of fun, fantasy & personal stories with American Songbook and Broadway favorites from Sammy Cahn to Harry Connick. Through it all you’ll get to know what it’s like to be Lucie Arnaz. Ms. Arnaz has had an extremely diversified career spanning over 45 years in show business. Daughter of legendary comedian Lucille Ball and Bandleader turned Television Pioneer Extrordinaire, Desi Arnaz, Ms. Arnaz is known for her eclectic musical talents and presents an array of tunes from The Great American Song Book to Broadway and Pop, as well as a tribute to her Latin roots and the music of her father. Ms. Arnaz made her Broadway debut creating the role of Sonia Walsk in Neil Simon and Marvin Hamlisch’s THEY'RE PLAYING OUR SONG, followed by a 39 year career on Broadway and Off in LOST IN YONKERS, DIRTY ROTTEN SCOUNDRELS, PIPPIN, MY ONE AND ONLY, the London premiere of THE WITCHES OF EASTWICK, and, with her husband, Laurence Luckinbill, national tours of WHOSE LIFE IS IT, ANYWAY?, EDUCATING RITA, SOCIAL SECURITY,I DO! I DO! and THE GUARDSMAN. Her television credits include six seasons of the HERE'S LUCY Show, co-starring with her brother, Desi Arnaz, Jr., Gale Gordon and her mother, THE LUCIE ARNAZ SHOW, SONS AND DAUGHTERS, THE BLACK DAHLIA, THE MATING SEASON, WHO GETS THE FRIENDS? and WASHINGTON MISTRESS. Ms. Arnaz won a GOLDEN GLOBE nomination for her performance on the big screen opposite Neil Diamond and Sir Laurence Oliver inTHE JAZZ SINGER. As director, she helmed the first workshop production of HAZEL: "A Musical Maid in America" in New York headed for Broadway and Michael Childer’s ONE NIGHT ONLY: Sondheim In Love. Ms. Arnaz is executive producer and director of the Emmy Award winning LUCY & DESI: A HOME MOVIE. Her musical recordings include JUST IN TIME, for Concord Jazz and LATIN ROOTS for LML Music as well as The original Broadway cast recording of THEY'RE PLAYING OUR SONG" . 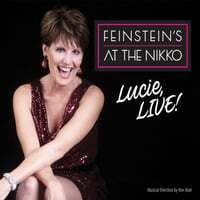 For the nearly three decades, LUCIE ARNAZ has toured her critically acclaimed nightclub acts throughout the United States and Europe making stops in Las Vegas, Atlantic City, Reno, Miami, Feinstein's at The Regency, Feinstein's at 54 Below and the Cafe Carlyle in New York, just to name a few. She has performed the opening number on The Academy Awards and at The White House. Lucie and her musical director, the remarkably talented musician, arranger, composer, Ron Abel, have worked in tandem creating entertainment such as this for nearly three decades and here Ron joins Lucie in an unplugged, brave and very intimate dance. Her live shows have such an intimate setting, that you feel like Lucie is singing right to YOU. She is always so engaged with her audience. The beautiful love songs and arrangements, mixed in with the humorous stories, (not to mention one very humorous song), make for a perfect blend. She never disappoints! If you have not yet heard the CD, I assure you that you will enjoy it! And, if you’ve never seen her show in person, just listening to this will have you checking her website for upcoming dates of her live shows. Lucie’s singing and Ron Abel at the piano, are a match made in musical heaven! It's jazz, it's about love gone wrong, but most importantly love gone really right! Don't forget that the Bossa Nova may have played a little role.